When Gena McGowan took over as principal of St. Matthew Catholic School in Phoenix in 2006, enrollment and morale were both low and the school’s finances were dicey. The school got an infusion of cash from the Catholic Diocese of Phoenix — $100,000 — and McGowan and her team leveraged that support to bring the school back from the brink. Today, the school is at capacity when it comes to enrollment and one reason for the school’s financial stability is a state tax credit program. Arizona was the first state to pass an Individual Income Tax Credit program, which allows taxpayers to redirect their tax dollars to School Tuition Organizations. Married couples in 2016 could redirect as much as $1,090 of their tax liability and single filers could redirect $545. In 2006, Arizona followed up the ITC program with the Low-Income Corporate Tax Credit, which has no contribution limit for individual corporations, though the statewide cap is set at $61.9 million for the 2016-17 year and that cap increases by 20% each year. S-Corp owners have the ability to contribute their entire personal tax liability to School Tuition Organizations, including Catholic Education Arizona, which formed in 1998 to collect donations and funnel them to students like McGowan’s. At St. Matthew Catholic School, every single family but one qualifies for free and reduced-price lunches. The tax credit programs are designed to support them. Scholarships through Catholic Education Arizona cover all but $1,800 of annual tuition at St. Matthew’s, where per-pupil costs are about $6,000 per year — well below the neighborhood public school. Fundraising, support from the diocese, and an adopt-a-student program help cover the difference, though St. Matthew’s does ask families to pay $10 per week as a financial commitment to the school. McGowan said the tuition tax credit has allowed her to hire more teachers and improve the quality of the instructional materials in the school. It has also made it possible to serve a student with severe cerebral palsy. This is the first year the school has employed a special education teacher. While much of the national conversation has focused on the possibility of expanding voucher programs during the Trump administration, Patricia Weitzel-O’Neill, executive director of the Barbara and Patrick Roche Center for Catholic Education at Boston College, says tax credits may be the better place to focus. Tax credits have been more popular and easier to approve in state legislatures. Besides Arizona, Florida has a tax credit program that helps many families afford Catholic schools. Charter schools have been blamed for declining enrollment in Catholic schools over the last 10 years. According to the National Catholic Educational Association, there was a 1.3% increase in enrollment from the mid-1990s to 2000, but in the last 10 years, enrollment has dropped 17.6%, with elementary schools being most seriously affected. 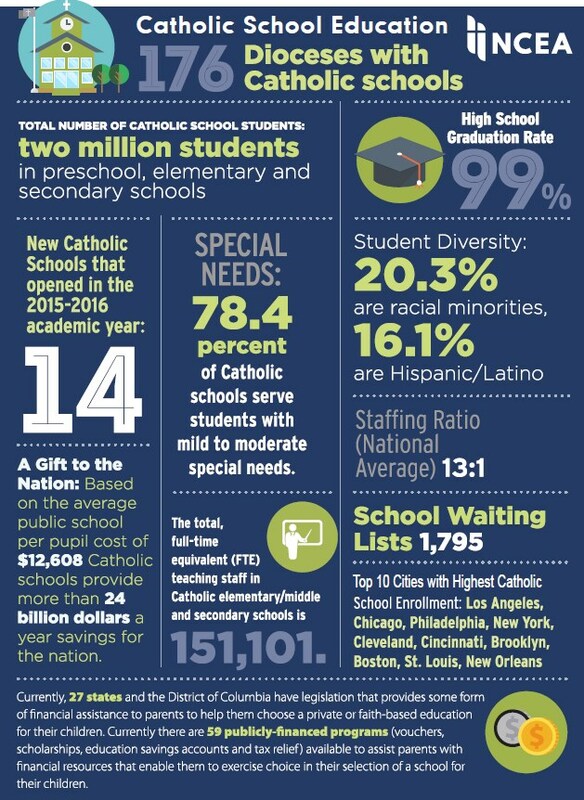 Still, Catholic schools serve 2 million students nationwide. Twenty-seven states and the District of Columbia have passed legislation to provide some form of financial assistance to parents who prefer a private or faith-based school for their children. That translates to 59 publicly financed programs, including vouchers, scholarships, education savings accounts and tax relief. In many urban areas, though, charters have provided free alternatives to district-run public schools that allow families to avoid tuition payments altogether. Some Catholic school leaders have gone so far as to call charters their biggest threat. But even though tax credit and voucher programs can reduce the financial barriers to enrollment, Weitzel-O’Neill still believes it all comes down to quality. Weitzel-O’Neill has seen Catholic schools around the country growing their enrollments with specialized programs like two-way immersion, which St. Matthew’s in Phoenix has, and those that focus on science, technology, engineering and math infused with religion and arts, or STREAM-based models. There was a net loss of Catholic elementary schools between last year and this year, but the National Catholic Educational Association is still celebrating Catholic Schools Week Jan. 29 to Feb. 4 from the perspective that Catholic schools are thriving. And with a strong supporter of school choice in the White House, the financial picture, at least, may get rosier still.